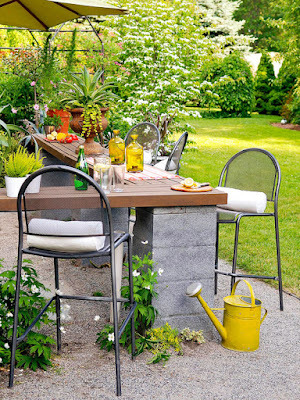 15 Cheap Backyard Ideas ~ Upgrading your landscape, patio, or deck doesn't have to be expensive or time-consuming. 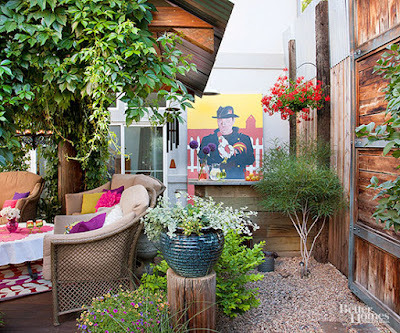 For a high-end backyard look without high-end expense, try this interesting technique: Espalier a tree. 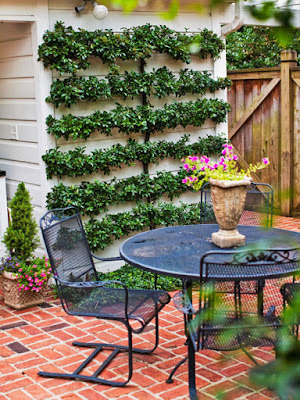 It's easier to create a living fence than it looks, and it can be used to add visual interest and texture to a blank wall. Furniture can be an expensive investment for backyards, but there are options for make-it-yourself benches, chairs, and tables. Here is one of our favorite budget landscaping ideas: low-cost concrete blocks, dry-stacked and covered with a foam pad, offer lots of seating in a high-traffic spot outside the home's back door. Outdoor lights remain a perennial favorite for outdoor spaces, and there's good reason: They're celebratory and fun, with just enough sparkle to keep the light from being distracting. 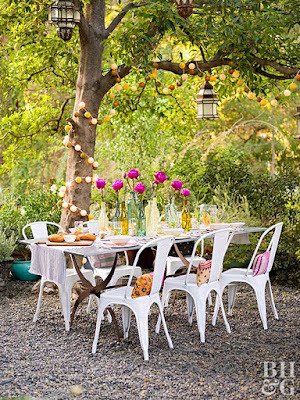 Inventive backyard options offer pretty colors and shapes; use them to wrap a tree, or drape them down a table for a twinkling centerpiece. 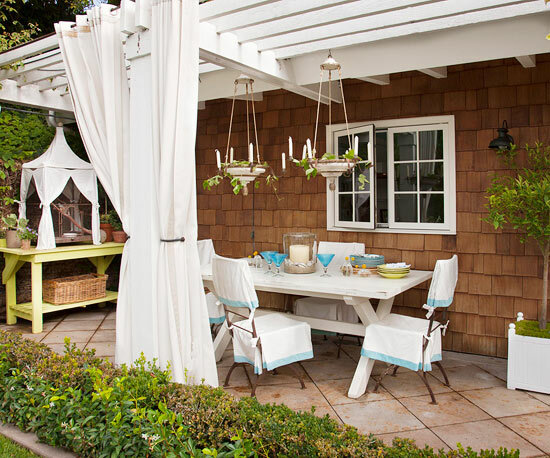 Sweeping fabric shades -- made from yardage, sheets, or other suitable material -- add elegance and beauty to a backyard patio space. 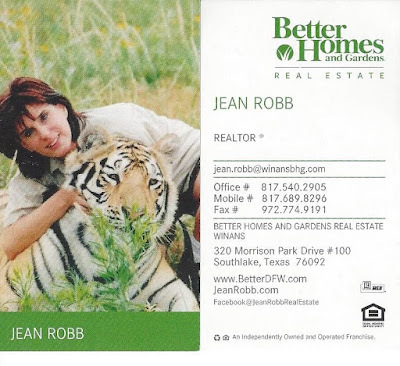 Plus, they can be used to shield family and friends from intense rays at key times of the day. In place of a more expensive light fixture, repurpose vintage elements into decorative backyard focal points. Here, nonworking chandeliers are outfitted with candles and trailing vines. 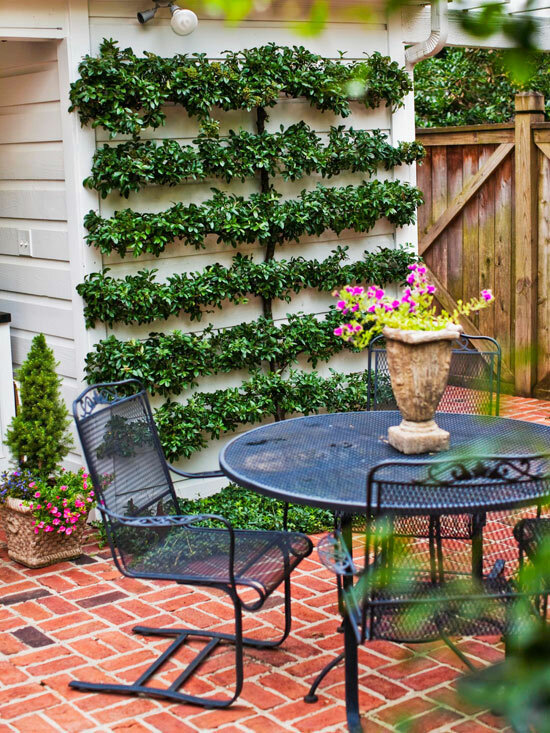 One of the most expensive backyard ideas in any landscape is hardscaping: walkways, retaining walls, edging. But the stone leftovers at your local landscaping, big box, or nursery supply store may be a less expensive option. 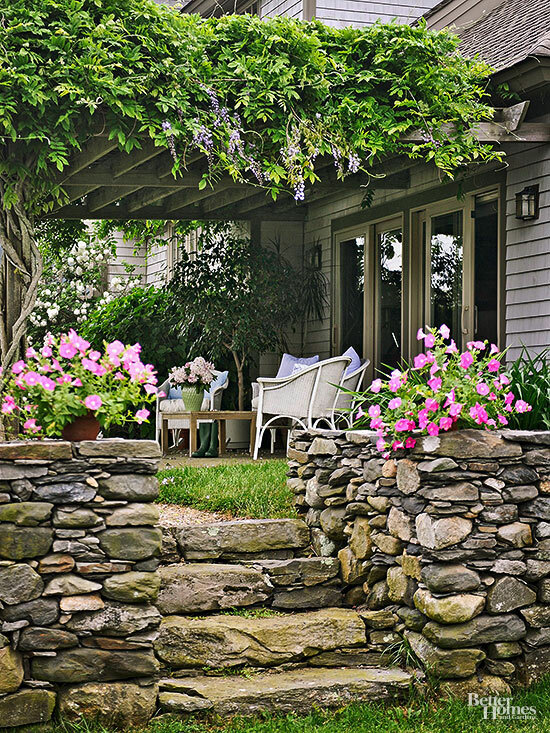 Placed together in a dry stack, the stones (such as these in the elevated garden section) offer a pretty backyard element that looks as if it's a natural, always-been-there part of the yard. Low-growing groundcovers soften the edges with charming blooms. Bonus: Those perennials can easily be divided to plant elsewhere and save even more. 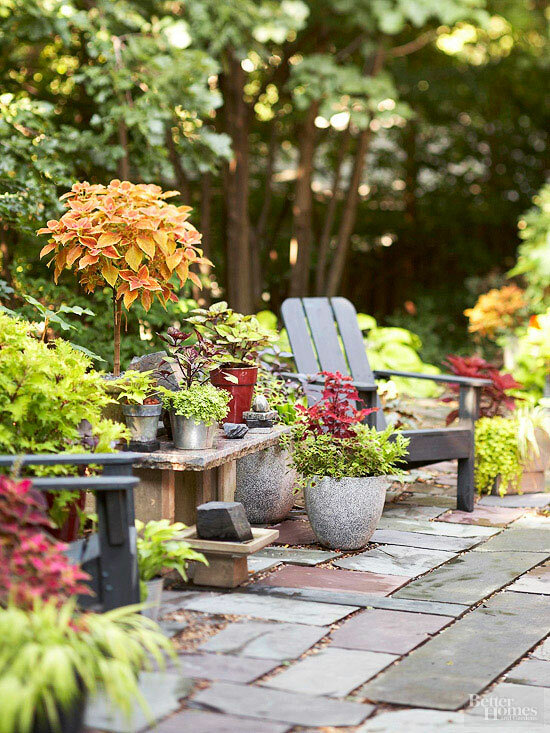 Check out all your options for hardscaping, including less expensive crushed rock and gravel. 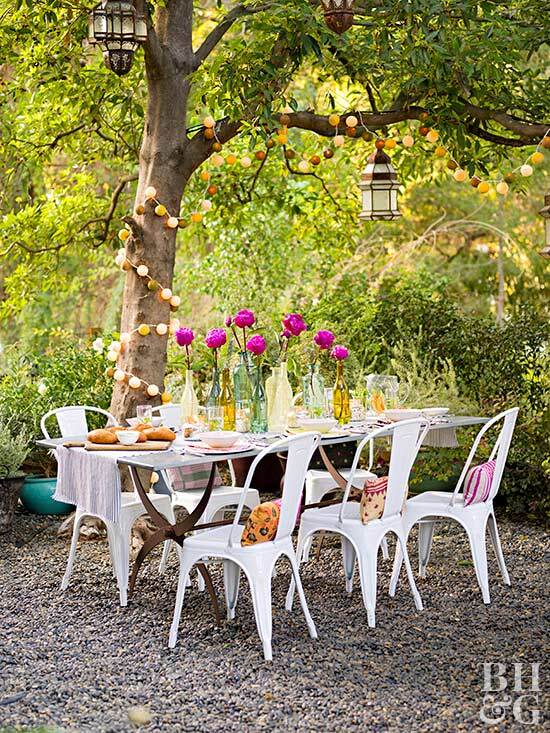 Options such as those supply a more casual surface underfoot for outdoor seating nooks and dining areas. 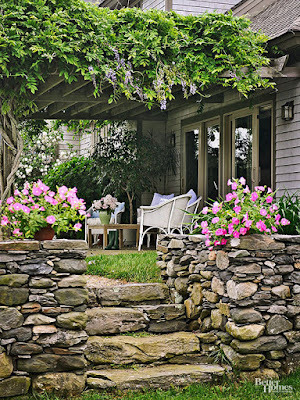 If you do use traditional pavers, consider unusual placement -- large stones interspersed with wide swaths of grass, for example -- to cut down on the total material needed. Annuals can be less expensive than perennials and shrubs, and they're a great way to add color and impact to a backyard, especially when arranged in containers. Here, matching vessels offer design cohesion, as does a similar color palette for the plants. 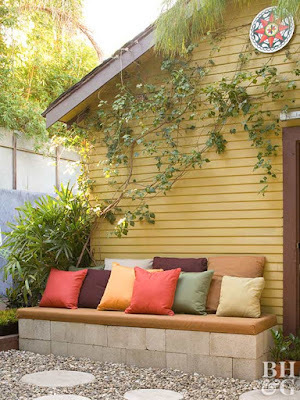 Another backyard idea: A stone slab on top of a lumber scrap makes for a casual outdoor side table.